Through TV, newspapers and social media we seem to be swamped with bad news on a daily basis. While there is no denying that some bad things are happening does it help to focus our attention on what is wrong with the world and our life rather than what is right? Well I think the answer is no, and we have more control than we think over what makes it into our awareness each day. 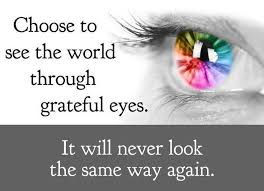 Research has shown the many benefits of cultivating gratitude, or choosing to focus on what we do have, what we can do and what is right about something rather than what is wrong. Practicing appreciation or cultivating gratitude has shown to improve our relationships, our mental and physical health, our self-esteem and mental strength and it can even help us sleep better. While we all fall prone to negativity and self-pity occasionally, cultivating appreciation and gratitude is something we can all build into our lives. Start with just one or two minutes and day and notice what happens, it is a change that you will not regret. To get you started I have added below some short exercises from the brilliant HearthMath Institute – happy practicing! Heart Focus: Focus your attention on your heart area, and breathe a little deeper than normal, in for 5 or 6 seconds and out 5 or 6 seconds. Heart Breathing: Imagine breathing through your heart. Picture yourself slowly breathing in and out through your heart area. Heart Feeling: Activate a positive feeling as you maintain your heart focus and breathing. Recall a time you felt good inside and try to re-experience the feeling. Remember a special place or the love you feel for a close friend, relative or treasured pet. The key is focus on something you really appreciate. Exercises provided by HeartMath Institute.